Four Figures on a Step is a far cry from Murillo's other genre pictures. Instead of the sweet, innocent, blameless street urchins that typically populate Murillo's paintings, here the viewer is confronted with a motley, unnerving cast of characters: a bespectacled hag holds the head of an immobile young boy (whose rear end is exposed for all the world to see) on her lap, while a disreputable lady lifts her veil and winks knowingly at us, next to a leering, sneering young man. What on earth could possibly be happening here? The answer is as simple as it is sinister: prostitution. The 17th century viewer would easily have recognized the hag on the right as a madam (or procuress); this character was commonly represented in Spanish art and literature as wearing spectacles and a handkerchief over her head. The coy gesture of lifting a veil was a common, come-hither symbol of the prostitute, while the bare buttocks of the child in the center should need no further explanation. 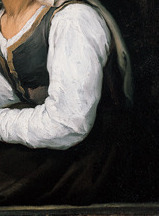 A closer inspection reveals that Murillo's painting may be slightly more complex than it appears, however. The artist appears to be employing two different layers of symbolism: the act of lifting the veil can be both the symbol of a prostitute, as well as a symbol of marital fidelity. Furthermore, the madam holds the faceless boy's head in her hands, as if she were inspecting his hair for lice; in Dutch genre scenes, this was a common motif representing motherly love and spiritual purity. Murillo thus creates a stark contrast between ideal values and the actual state of Spanish society, effectively creating a much more somber, hard-hitting portrait of the ills of contemporary Sevillian society than any of his other genre pictures. The circumstances surrounding the commission of Murillo's Four Figures on a Step are unknown, but his genre pictures were often commissioned by Flemish merchants in Seville who were ravenous for this type of subject matter, which was so popular in their home country. Murillo's genre scenes, which were without precedent in Spain, also grew to be cherished and admired in his home country, so the painting could also have been executed for one of Murillo's compatriots. Unlike most works in Murillo's oeuvre, Four Figures on a Step does not have a religious theme and had no real precedent in Spain and is thus open to wider, more complex interpretation interpretation. One thing that is clear about this work however is the harshness of the subjects and this is because Murillo's subjects are street people. The mature woman in this image is similar to bespectacled characters in Dutch and Flemish genre paintings, who check children's heads for lice. Murillo knew such works through prints and was therefore aware that delousing a child was a metaphor for cleansing the body and soul. Hence, Murillo's painting may be conveying a message of urging the observer to resist the temptations of worldly pleasures. Not long before this painting is believed to have been created Seville had been hit by a bubonic plague and three years after this there was a severe famine followed by a food shortage. It is not known how greatly these factors influenced Four Figures on a Step but this work is typically Murillo; there is careful modeling and unifying light. His figures are confrontational and taunt the viewer. Furthermore, the harsh lighting reinforces the rawness of street life and accentuates the divide between those looking to buy the painting and the lower-class subjects featured in it. 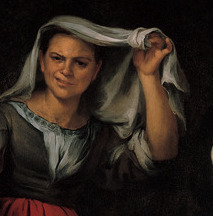 Murillo's Four Figures on a Step is executed with life-like naturalism: observe the hardened, wrinkled face of the procuress, for example, and her dark, heavy, veined hands. Murillo was a master of capturing fleeting facial expressions, and in this painting he does not disappoint: observe the knowing leer of the boy to the left and the meaningful wink of the prostitute. Early in his career, Murillo was heavily influenced by the dark chiaroscuro of Caravaggio and Zurbarán, but by the 1660s, Murillo's style was far lighter and more cheerful: this makes Four Figures on a Step something of an anomaly. Murillo most likely employed this severe lighting, with the darkest, most impenetrable of backgrounds and starkly lit foreground figures, to imbue the painting with a more dramatic, sinister feel. Most viewers would agree that this technique was, indeed, most effective. As is typical in Spanish painting, Murillo's figures are placed in an abstract, compressed space, forced into the extreme foreground of the painting, as if on the stage in the theatre. Murillo's genre pictures follow the Dutch example in that they are imbued with a spiritual, moral message (Italian genre scenes are often devoid of such morality). Murillo was a pious Catholic and a member of the Franciscan Order, and his genre pictures often address the problems of contemporary society in Seville, such as the poverty of orphaned children or, in this case, child prostitution. Typically, however, these genre scenes are somewhat sugar-coated and idealized; Four Figures on a Step, on the other hand, is grimly candid in its depiction of a sordid reality. Four Figures on a Step is utterly unique as a subject, but Murillo was likely to have been influenced by the work of other artists in his execution of this canvas. 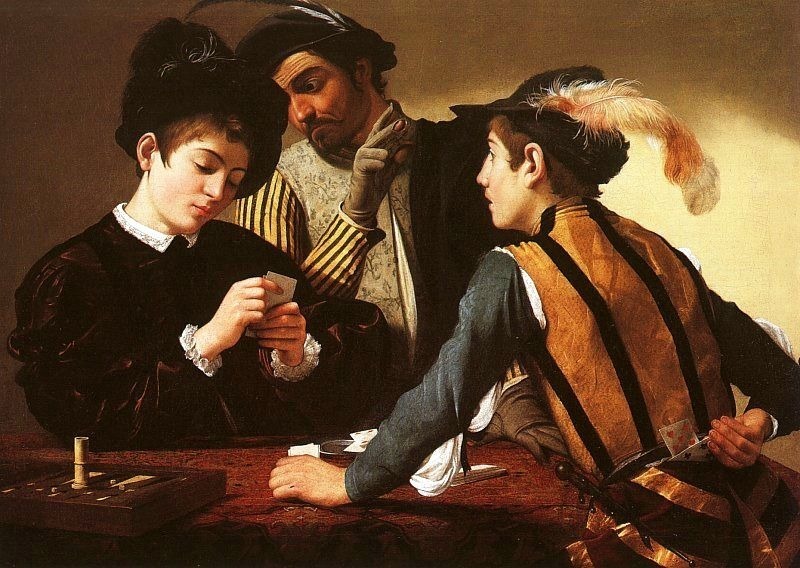 Murillo was definitely inspired by Dutch and Flemish genre scenes in general, but in this painting the influence of Caravaggio shines through. First of all, the inky black, darkly dramatic chiaroscuro of Four Figures on a Step obviously recalls Caravaggio's style. 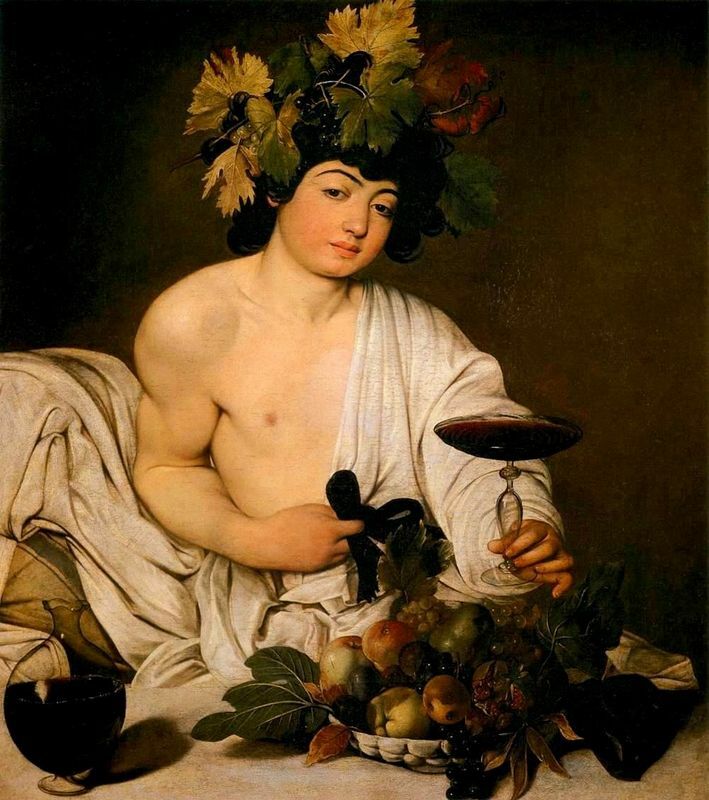 Also, Caravaggio is famous for his depictions of the riff-raff of contemporary society (such as in his The Fortune Teller or The Cardsharps), while his early paintings are also often imbued with a latent eroticism, such as in the Bacchus, where the young boy's body may or may not be available for purchase. 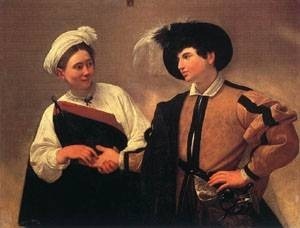 Caravaggio was enormously influential for the painters of the Spanish Baroque, and Murillo (at least at the beginning of his career) was certainly not immune to this influence. Art historians classify Murillo's paintings into three very loose categories: religious works, genre scenes, and portraits. The religious works dominate Murillo's oeuvre by far, and it is for these paintings that Murillo is the most famous. 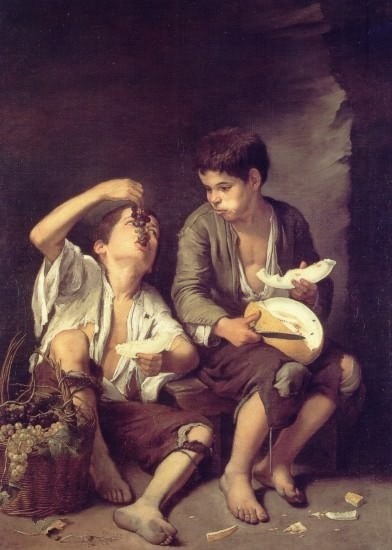 Yet Murillo's genre paintings have also garnered the artist widespread popularity, particularly for his sentimental paintings of street children. In these paintings Murillo may have paid careful attention to naturalistic details in the depiction of his figures, but overall the subjects are quite idealized. These pictures are often imbued with an underlying religious message. However, what many people do not know is that these were not the only genre scenes that Murillo painted. In stark contrast is the grim, slightly subversive Four Figures on a Step, a painting about much grimmer themes like prostitution. Murillo's paintings were the triumph of the Spanish Baroque. Although today Velázquez is cherished as the genius of the 17th century, in his own time Murillo's paintings were far more widely known outside of Spain, and were considered so valuable that at one point the king actually forbade their export. The sweetness and easy accessibility of Murillo's style was a welcome relief from the darkness and grave sobriety of artists like Zurbarán, and the inoffensive piety of Murillo's paintings made them perfectly suited for Counter-Reformation tastes.